Are you seeing a significant decrease in your organic traffic? Does a one believe that it is due to the Google Panda algorithm? If yes then, his six senses is bang on target. 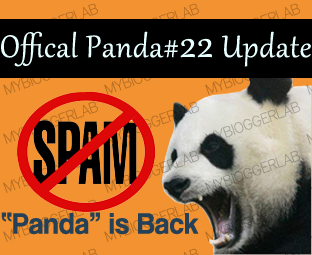 There were some rumors going around in the Blogosphere about the Panda 22th algorithm which was later on declined by Google. However, on this occasion they have officially confirmed that Panda 22th is finally updated. The Google Panda#22 affected around 0.8% of queries in English all across the globe which proves that it wasn’t a foremost update. On the other hand, many of the webmaster saw a slight decline in their traffic. Today in this article, we will be discussing more about Panda#22 Algorithm and would wrap-up the article with some unique tips. About 10 days ago we thought that Google has updated its most dangerous algorithm The Panda update. The news got more serious when we witnessed a spark among the webmasters due to the decline in their organic traffic. However, Google declined by saying that, “We make over 500 improvements to Google Search each year so we can surface high-quality information for our users. However, people may witness a change within 10 days”. Those 10 days are passed, and Barry of Seroundtable again emailed Google for more ups about Panda, and this time they have confirm about the refresh. Google told us that, they have updated their Algorithm on 21st of November, less than 2 days when we first emailed them to confirm about the rumors. What is coming next, any new Algorithm update? We don’t think that Google would launch any new algorithm update because they already have four algorithm to take care of i.e. Panda, Penguin, EMD (Exactly Matched Domains) and Page Layout Algo. Well, we believe no one should care about these updates and start to concentrate on quality content. Once, people would give less attention to these Algorithms Google will stop brutalizing bloggers. We are implementing the same technique because Quality matters a lot. Following are the few unique tips and techniques that are essential to follow if any webmasters want to protect him from all kind of Algorithm updates. Write Fresh Content: No matter what happens if anyone will write fresh and original content then no one even Google would be unable to penalize. No False Backlinks: Instead of wasting time in commenting for the sake of backlinks. Try to write gorgeous content because, content is the only thing that could amuse visitors, and Google too. Be the Leader, Stop Copying content: To be honest, people spends lots of their time in spinning and copying others content. Remember one thing copiers can never be the leaders. That’s all we have for tonight. Hope everyone would be happy to see an increase in their traffic. This is the first time when Google has rolled out 2 Panda updates in same months, which mean that the time near when we will witness more than 2 updates per month. Whoa! That sounds devastating? Indeed. What are you feelings about this algorithm? Take a lot care till then Peace, Blessings and happy Updating. I am much affected !! I really like this update,,because now i finally rank #1. Thanks for sharing this bro.. Woahhhh..!!! There are too many bloggers want to spin the article.. We can not avoid them..
To be honest, Quality content is enough to Fight against Any Kind of Algorithm update because its the basis demands as prescribed by Google. Now if you have great content that its quite clear that You will get all the traffic from Search engine and ultimately it will increase your traffic and engage more and more visitors. Yeah, Socializing your content is essential to get better result but it will only work if you are dedicated towards your website. i got benefit with this as my traffic has increased a lot..
@Syed faizan ali how to add adsense with post image?? ? ? You have Completely Copied our Template. We Contacted you but didn't got a Reply. Therefore we have Told Google to Blacklist your site. If you Didn't remove our theme with 48 hours then you might receive a Legal message from our representative. We Told you many times almost 100 times but you didn't do that. Therefore, either remove it or you have to face legal action. It takes 48hours in which Google Blacklist a Site. Remove it and we will take back the Blacklist request. Its your Choice. Dude, that Theme is complelety Illegal to Share. They didn't asked us about the copyrights and replicated a theme similar to us. We Hate such Peoples who shared out stuff without giving credits. We will file a DMCA Complain against them and would also Blacklist his Domain so he didn't do such illegal Stuff again. dude i have a template and i was not able to add footer like yours. So if you can help me to add footer. Can you please give your email id so that i can send it to you. Peace and blessing. Syed it will be better if you don't teach me copyright rules and regulation.We didn't copy your theme, Laboratory theme is having very different style. Like- Navigation,Footer,Page Navigation And Sidebar.If you want them you can file case we are ready to handle it. Its a Replica. You Copied Our Following Stuff. Just want to say something in this matter. After going through the sources of the template LordHtML provided yes it is copied or I say influenced by MBL .I am a Blogger and Wordpress Theme developer also and I know it takes only 3-4 hours to completely copy a blogger template. But after every copy someone makes they should and has to give a footer credit to the original site. By this way both side can be secure (Though some people and me also hate to see my hard worked and precious theme just been copied by someone in 4 hours. :) ). So I guess @Aumaur you should give the credit.